Omnicam upgraded to shade detection model, PC upgraded to v2.2.5 (2015), passed all function tests, and successfully calibrated. MC XL has been upgraded with carbide bur compatible S1 motor and mesh sieve, completed test mill, 100% passed diagnostic tests, and successfully calibrated. Ivoclar Programat CS has LOW firing hours, updated to latest 3.20 software, successfully calibrated, and passed function tests. All systems tested and calibrated 3/21/2019. Call (844) 385-4376 or e-mail sales@cadcamhero.com if interested. Sirona's Omnicam camera offers superior handling and ergonomic design, powder-free scanning and creates precise 3D images in natural color. The Sirona MC XL is a two-motor workhorse capable of grinding inlays, onlays, crowns, veneers, 3-unit span bridges, custom abutments, CEREC Guide 2, and wet milling zirconia, resins, and temporaries. The MC XL can precisely mill or grind out a crown in 7-11 minutes! Ivoclar Vivadent's Programat CS is the original ceramic and crystallization furnace specifically designed for the crystallization of IPS e.max CAD restorations. 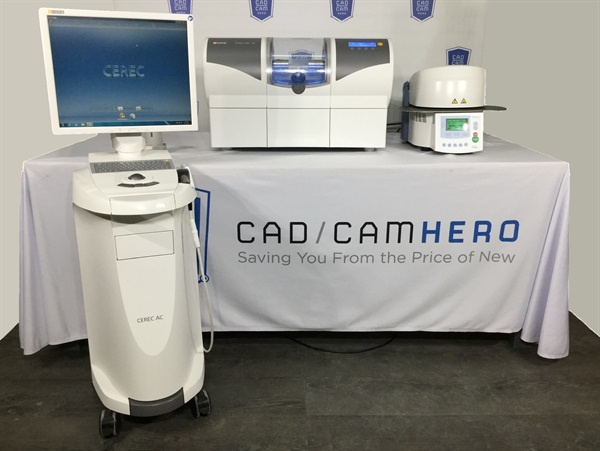 This system was tested and calibrated by CAD/CAM HERO on 03/21/2019. A valid Patterson change in ownership form will accompany this sale.